For this month’s Spotlight we spoke with Mr. Carl Stovner, owner of ASAP Septic, which operates out of Council, Idaho. Q: Can you tell me a little bit about your background? What is your education and training? How you got into the business? How does what you did before inform your present business? My dad got into the septic tank business in middle-school when he started working for a family friend who cleaned septic tanks as a supplemental income to his junkyard business. I think that only lasted a few years though. He went on to do a lot of mechanical work as a logger and a rancher. We got into the business when he bought it from my uncle. It was only one old GMC truck with a 2000 gallon tank at the time. My dad used his background as a mechanic to keep that truck running and then to expand the business by converting pickup-trucks into portable toilet trucks. The first ones he converted were old Dodge trucks that he put old fertilizer tanks on and then set up vacuum systems that ran off of the exhaust. Later on, he replaced those rigs with pickups that had proprietary pumps that we ran off of 8 horse-powers Briggs and Stratton motors which were eventually replaced by Ford pickups that were pre-converted by Satellite. His mechanical know-how was a huge part of keeping costs down and being able to keep things running. Those are skills we still require today. We never hired anyone who had a background in liquid waste management, but if they knew how to fix an engine and weld, we could teach them everything else. Q: Please tell me a little bit about the history of your company—when it started, the original owners, who works there, what changes you made since you took over, how much the company was worth when you took over , how much is it worth now? The company was really started when my uncle Al bought the old GMC septic truck. They called it Al’s Septic. When we bought it in 1985 it was worth $30,000. We kept the name until we started renting portable toilets which was when my dad came up with the name Al’s Septic and Portables, or ASAP. We sold the portable toilet part of the business but kept the name ASAP Septic. We also added roto-rooter, power jetter, and drain line inspection to the business. We service a four county area that’s roughly 115 miles from one end to the other. The company is now worth roughly $1 million. Q: Tell us about the employees that work for you. The company has two full time employees. Danna Stover is the Owner/Office Manager and Paul Shumway is the Operator. We also have some as needed drivers who will work the occasional job if they’re available. Since the company is so small, our employees have to wear a lot of hats. Danna answers all of the phone calls, schedules all the jobs, takes care of all the advertising, and does all the billing/payroll. Paul is our man in the field. He does all of the septic/drain-line jobs as well as all of our in-house maintenance and mechanic work. As far as management/leadership style, we run things like a family. I suppose that’s how we do things because our employees have always been family members or people who, like Paul, come from families that we’ve known for so long that they might as well be family members. Council only has 800 people living in its city limits and we’re an hour and a half away from the nearest Walmart so everyone pretty much knows everyone else in the region. Q: How do you boost efficiency in your jobs and your workers? How do you boost morale in your workers? What do you expect of them? Who trains your technicians? What is the training process for technicians and administrative staff? Charley always taught everyone to “never waste a motion.” That means you keep all of your tools and equipment well organized so that, whether it’s changing a rooter head or offloading a truck, you’re always trying to be as efficient as possible. We’ve also always been firm believers in boosting efficiency and morale in our employees by paying them well. Charley always said “If you want good work from people you have to pay them well and treat them right.” Training has always been on the job. Especially with rooter work, the best you can do is bring someone along and show them the basics and some situations they might encounter, and then they just have to do it and learn for themselves. There’s no way to prepare someone for all of the situations they might run into. Q: What is your business model? How have you structured your business in order to secure new customers? What about your bidding and estimate process? Do you have anchor clients and then branch out around a particular area? What is the general size of most of your contracts? How many do you work on in any given month? Our region is a place where people will still often look up your number in the phone book so we do a lot of advertising there. It also helps that we’re one of the oldest companies in the area. We’re also the only company in the area that offers a full line of rooter, power-jetter, and drain line inspection/location services. We have base customers whose tanks we’ve been cleaning since 1985. Most of our contracts are residential, though we also do work for the municipalities in our region. Charley was a firm believer that you shouldn’t bid a job at a price that it wasn’t worth doing. This means we’ve lost business to competitors who under-bid us from time to time. On the other hand, we’ve seen some of these companies go out of business from bidding too many jobs too low. The amount of jobs we do varies with the season. Winter is very slow, spring and fall are our heavy months. Over the years we have upgraded all of our trucks and equipment. We were able to do this without borrowing from a lender. We run older trucks that are paid for. To keep them running we do all the repairs and serving in house. We keep a fresh clean look and our trucks serve as adverting bill boards. Q: What part experiences the most growth in your business operation? Why do you think this is the case? Who are some of your biggest clients? The biggest area of growth we saw was in portable toilet rentals. That part of the business became so big in fact, that after Charley died in 2009, we felt we could no longer handle it and sold that part of the company. Our biggest client has always been the National Forest Service. 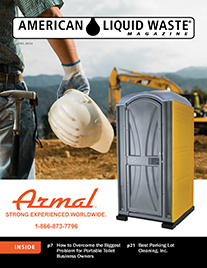 Our area often experiences large wildfires and whether it’s renting portable toilets or pumping shower bladders, we’ve been happy to do our part in helping to manage these disasters. We’ve always added a new service because we saw that no one else in the area was doing it. Q: Tell me about the day-to-day operations. Tell me about your truck and vehicle scheduling. How does your team share information back and forth? How are they managed? By who are they managed? Danna and Paul coordinate jobs over the phone. Most of our septic sites are 1000 gallon residential tanks. That said, since our area is so vast and mountainous, for example it can take 2 1/2 hours to drive from one side of it to the other. Paul is almost always doing more than one septic-tank job per-trip to a given part of the region. On top of that, he never leaves our home base without rooter equipment in just in case there is an emergency job near where he is working. We send out septic tank cleaning reminders in the mail to past customers every 3 years. Q: What are some of the distinguishing features and services of your company that are unique and that no other local company has? We’re the only company in the area with a full line of rooter, jetter, and drain line/inspection service. In our region, there really aren’t target populations as there is barely any population at all (just kidding). We’ve always strived to be the company that can get to your job first and get it done right the first time. We feel that reputation is worth the few jobs we lose to competitors who might have slightly lower prices. Color has always been a big part of our identity. At one point our entire fleet was red and we recently changed our trucks to a light blue color to distinguish them from another company using red trucks. We also strive to be friendly and professional when we’re on a job site. Word of mouth is probably the biggest source of information in our area and so you our goal is to leave a job with the problem fixed and the customer happy every time. Q: What is in the ASAP garage? We operate a Freigtliner FL80 with a Cat 3126 engine, Eaton Fuller 9 speed, with a 2000 gallon gray water tank. This is our smaller truck and runs year round as it is easier to chain up in the winter and get in and out of plowed driveways. Our larger truck is a Kenworth T800 with a 60 series Detroit, Rockwell 10 speed transmission, with a 3000 gallon gray water tank. This is the truck we us mostly during the spring, summer and fall. Because of its size, we can schedule 3 tanks with this truck to cut down on our road miles thus saving fuel to jobs. 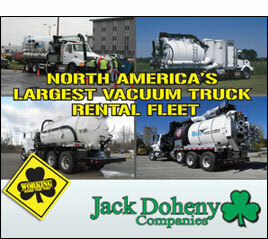 Both trucks are vacuum systems with Masport pumps. We have been pleased with the Masport pumps and have been able to do repairs on them in our shop. We also use a 2011 Dodge 3500 4×4 equipped with a Tommy lift gate, a Stainless steel 300 gallon gray and 200 fresh water slide in tank. This truck is designed to do drain line jobs, we have mounted outside storage boxes to transport our drain line machines, and we took the back seat out and use that area to transport the Rigid SeeSnake camera that we use for septic system inspections. Our Hydro-jetter machine is a Hotsy pressure washer with a Honda motor and is mounted on this truck for those frozen or tough drain line jobs. We carry Lar-Ken septic risers and lids to install for customers. The Tommy Gate works great for these jobs. This truck also has a Masport vacuum pump, the smaller tank is great for little jobs and grease traps. We operate a wide variety of Gorlitz Drain line machines, from large mainline units to the smaller sink line machine. This company has been outstanding to work with. We use all their cutter heads, Aquamole jetter heads, and their cables and reels. We repair all our cables in the shop to cut down on the cost of new cables. We operate a Ridgid SeeSnake camera to determine the exact location of broken lines for hard to find problems for our customers. We find the Ridgid hand held Navitrack locator very useful to locate those difficult tanks. This unit is used on a weekly basis, and it saves our customers time and money. Q: How much waste do you collect and dispose of? Where do you dispose it? 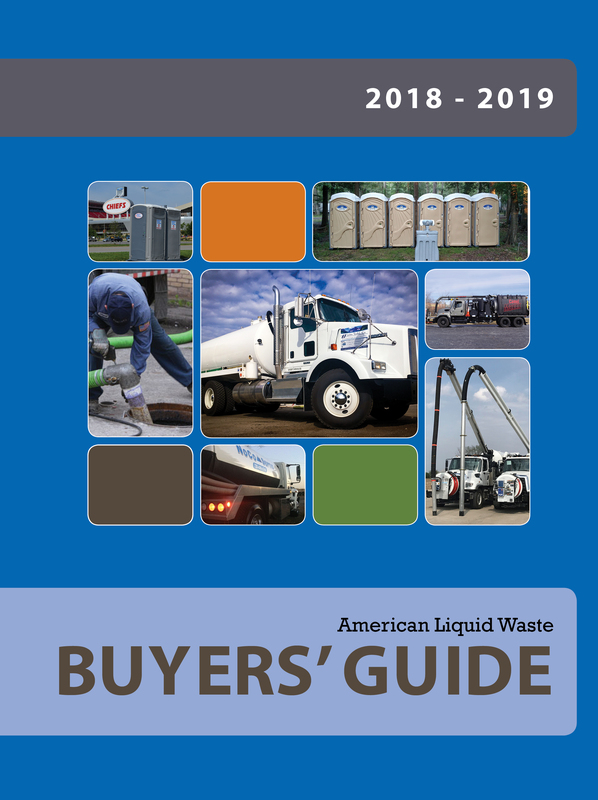 How does the whole disposal process work in your particular municipality or state? We are permitted and licensed through our State District Health Department which includes a comprehensive annual inspection of our equipment. We applied for Waste Disposal rights to 4 different area lagoons for disposal of the waste we collect. We pay by the gallon for the waste we depose of at these sites. Because we are so rural these sites have welcomed the per gallon fees as income for their operation. At this time this is the only disposal process we use and are happy to maintain a successful working environment. We follow all State and National regulations and never dispose of waste except at these pre -approved locations. Q: What are the most challenging aspects of your business and industry? What hurdles do you confront and how do you handle them? What strategies do you have in place to successfully find solutions emergency situation challenges? Probably our biggest challenge now is that we are a woman-owned business. Danna is incredibly knowledgeable about septic and drain line systems but she often meets skepticism from clients when she helps to begin diagnosing their problems over the phone. She meets this challenge by remaining professional and patient. As far as emergencies go, we will work weekends, late nights, and holidays but we’re very upfront with our increased fees in these situations. Our winters are very, very cold so we get a lot of frozen lines in the winter months. This leads to lots of emergency work. Q: What do you see or expect, or how do you handle seen or unseen outside forces, that may affect your company’s success? How much of an eye do you keep on new and emerging technologies that could change/modify how you and your competitors do business and provide the best services? Keeping abreast of new technologies and opportunities is a big part of how we’ve found success as a company. We’ve done this through attending trade shows and reading publications. 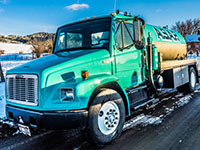 For more information on ASAP Septic, Inc. please visit their website: http://asapsepticidaho.com.